March 2, 1941 David Satcher, physician and public health administrator, was born in Anniston, Alabama. Satcher earned his Bachelor of Science degree in biology Phi Beta Kappa from Morehouse College in 1963. He simultaneously earned his medical degree and Ph.D. in cytogenetics from Case Western Reserve University in 1970. From 1979 to 1982, Satcher served as professor and chairman of the Department of Community Medicine and Family Practice at Morehouse School of Medicine, from 1982 to 1993 as president of Meharry Medical College, and from 1993 to 1998 as director of the Centers for Disease Control and Prevention and administrator of the Agency for Toxic Substances and Disease Registry. 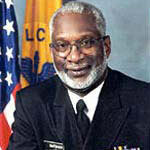 In 1998, Satcher was appointed Surgeon General by President William Clinton, a position he held until 2002. In 2006, Satcher established the Satcher Health Leadership Institute at the Morehouse School of Medicine to improve public health for all Americans and to eliminate health disparities for minorities, the poor, and other disadvantaged groups. Satcher is the recipient of many honorary degrees and other honors, including the New York Academy of Medicine Lifetime Achievement Award in 1997 and the Jimmy and Rosalyn Carter Award for Humanitarian Contributions to the Health of Humankind from the National Foundation for Infectious Disease in 2004. Satcher serves on the Board of Directors of Johnson and Johnson, MetLife, and the Kaiser Family Foundation.